In 1906, a group of 25 Presbyterian families established a summer retreat on Crane Island in the southwest corner of Lake Minnetonka. They cleared the excess brush, constructed 13 small cottages, and eventually built a tennis court at the center of the isle. Each summer, the families would arrive via ferry or rowboat, and each fall they would pack up their Bibles, hymnals, croquet balls, and picnic baskets and return to the city. The island was only a short distance from the mainland and just 25 miles from downtown Minneapolis, but the quiet pace must have made it seem like civilization elsewhere didn’t exist. Today, Crane Island has telephones and electrical service. There are no cars or trucks, but speedboats and pontoons are moored at the docks of many homes on the island. Some of the original cottages remain, and the island was added to the National Register of Historic Places years ago, yet new construction has not been prohibited. Officially, the island is part of the city of Minnetrista. Given the quaintness of the island atmosphere, the clients wanted a place that fit the environment—both natural and cultural. 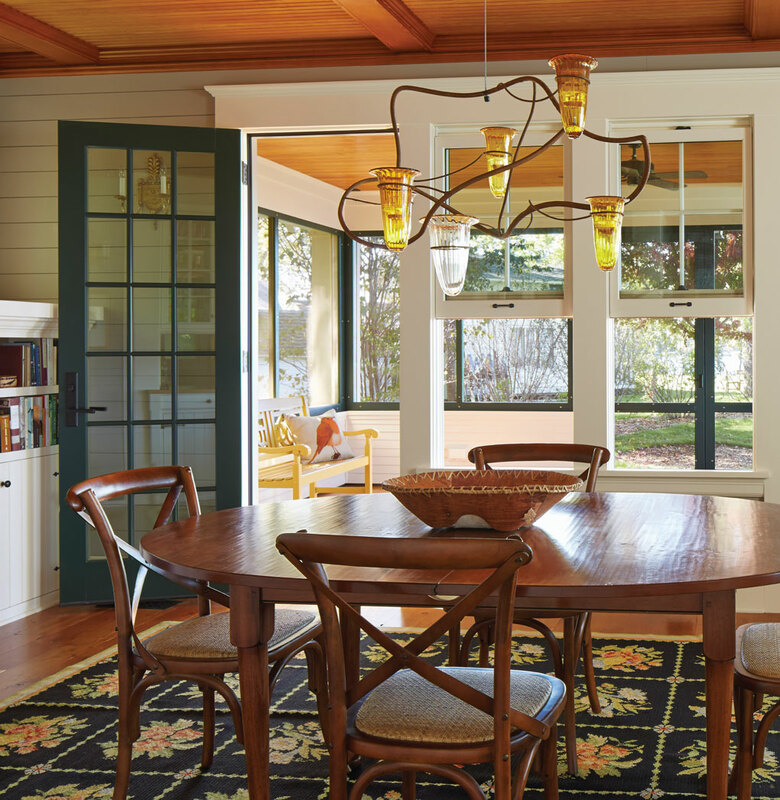 They had hired Heide to remodel their home on Lake of the Isles in Minneapolis largely because of the designer’s sensitivity to historic details and his understanding of what makes a home sumptuous and comfortable. 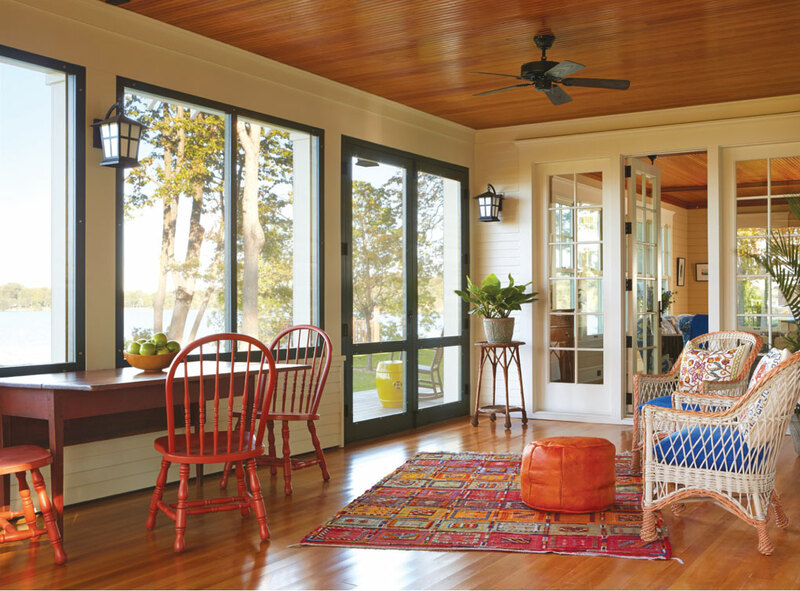 The Crane Island house didn’t need to be big or fancy, but the clients wanted quality, beauty, and comfort in their home-away-from-home. Heide designed a 2,900-square-foot two-story home to meet their needs. 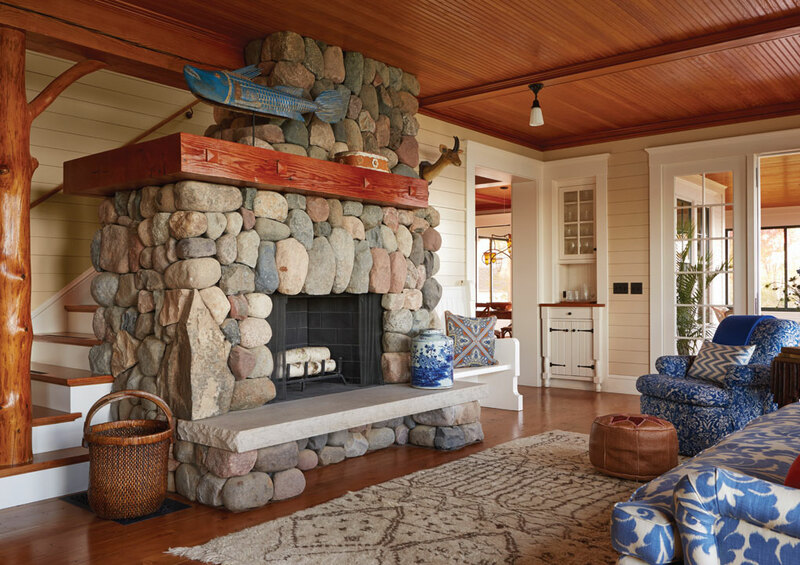 With a wrap-around porch, shed dormers, and a fieldstone chimney poking up from the center, the cottage, completed last fall, looks like it was built more than a century ago. 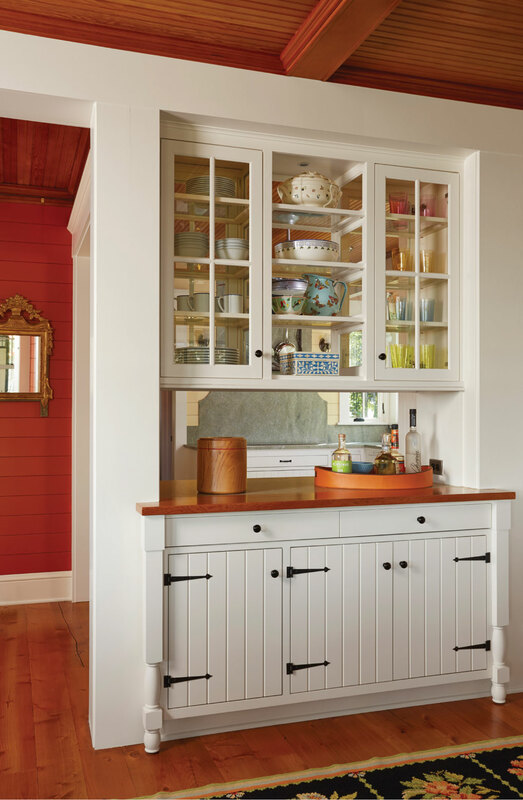 “The client specifically wanted a house that appeared to have been there for 100 years and that was almost indistinguishable from other houses on the island,” Heide says. To achieve that look took some sleight of hand. Study an old house and you’ll see that the tops of the windows nearly reach the eaves, Heide says. The residences sit lower on their foundations and the floors are thinner. Getting the proportions of the Crane Island cottage to appear a century old, for example, required hanging the floor joists into the basement space, rather than resting them on top of the foundation. Because of this, the cottage appears to sit closer to the ground. The upstairs contains a master suite with an adjoining bathroom, as well as two guest rooms and a bath. Built-in bookshelves and cabinets hold volumes for reading on rainy days as well as other distractions. The cut of the dormers gives it a compact feeling. This summer, the island’s current residents will celebrate the 110th anniversary of the Presbyterian association that established the Crane Island Community. There will be a pig roast, lemonade, bouquets of wildflowers, and lots of talk about how wonderful it is to spend summers on the island. Some of the homes may be brand new, but in 110 years, the way of life hardly seems to have changed at all. 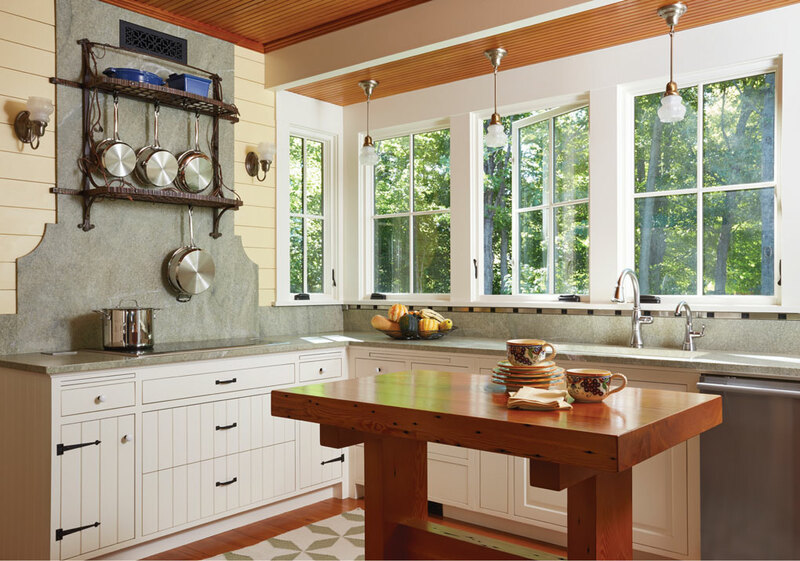 Joel Hoekstra writes frequently about design and architecture for Midwest Home and has contributed to a wide range of publications, including This Old House, Metropolis, ASID Icon and Architecture Minnesota. He lives in Minneapolis in a 1906 Dutch Colonial that is overdue for a full remodel—or at least a coat of fresh paint.